Even if your physical location is far from the road, a well-placed sign that is visible and easily identifiable is worth its weight in gold. A good sign is a physical symbol of quality and reliability that clients will notice both in print advertisements and if they happen to be driving by. Equally as important is the physical condition of your property, which should always be in tip-top shape as if company is coming to visit. Place signs on your trucks and on your mobile storage containers. These spread the word without you having to pay additional advertising fees. These “mobile billboards” will travel far and wide, which can help expand your potential client base very quickly. Develop strong relationships with local real estate agents. They can include advertisements for your mobile storage solutions within brochures and flyers. This information can be disseminated via the mail, at home shows, open houses, et cetera. You should strive to develop relationships with multiple realtors within the regions you operate in. When their clients buy a home, your business will be one of the first they think of when they’re ready to move. Take to the web to showcase your services. Displaying photographs, sharing moving/packing tips, and advertising specials via social media channels like Facebook, Twitter, Instagram, etc., can help you reach a vast audience without having to spend a lot of money. It is fast and can be highly effective when executed properly. It also doesn’t take much time, as most posts can be written within a few minutes and reused on a schedule that you can plan in advance. If your community has a large employer or employers that are continually bringing on new employees, they have a need for your services. Offering discounts to their new hires can help ease relocation burdens and make it easier for them to fill positions. Over time, this can create a steady stream of income that you can build your business upon. Builders and renovation companies need mobile storage for their operations. Developing rental programs that meet their needs can help them stay on target and stay within their budgets. By establishing and marketing custom rental programs for their needs, you can create a steady flow of repeat business. Get involved in the community. Indirect advertising in the form of sponsorships, scholarships, etc. can solidify your reputation within the community. The more active you are within your community, the more visible and recognizable your business will become. 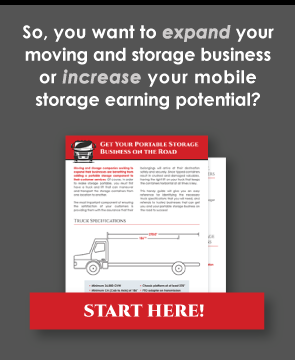 Effectively marketing a mobile storage business requires time, patience, and a little bit of money. Marketing is something that you will need to do every day your business is open. Creating a healthy mix of marketing strategies that work within your market is essential for long-term operations. Equally as important is adjusting your marketing strategies as the market changes and your brand becomes established. Thus, each of your strategies should be carefully monitored to determine their effectiveness. As old strategies become less effective, readjust your approach based on the data your marketing streams provide.